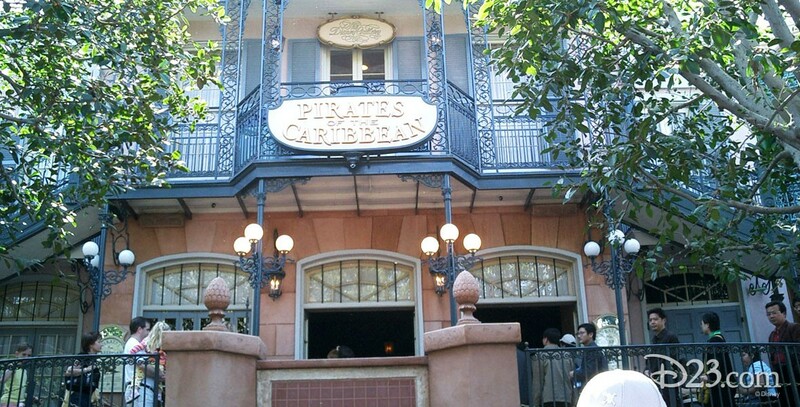 Pirates of the Caribbean New Orleans Square attraction at Disneyland, opened on March 18, 1967. One of the most elaborate uses of Audio-Animatronics figures ever attempted by Disney, and still considered the favorite attraction by many guests. Walt Disney worked extensively on this attraction, but passed away before it was finished. Guests travel by boat through scenes of pirate treasure, ghost ships, and a Caribbean town being plundered by an inept bunch of brigands, to the sounds of the attraction’s theme song, “Yo Ho (A Pirate’s Life for Me).” Also in Adventureland in Magic Kingdom Park at Walt Disney World, opened on December 15, 1973; at Tokyo Disneyland, opened on April 15, 1983; and at Disneyland Paris, opened on April 12, 1992. Revisions were made to the Disneyland and Walt Disney World Magic Kingdom attractions in 2006, and to Tokyo Disneyland in 2007, adding the Captain Jack Sparrow character. An entirely new version, based on the Pirates of the Caribbean films, opened as Pirates of the Caribbean – Battle for the Sunken Treasure at Shanghai Disneyland on June 16, 2016.